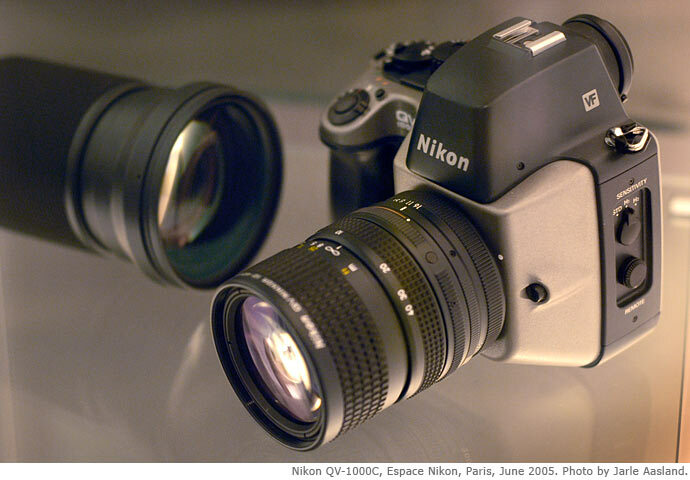 Nikon QV-1000C? Never heard of it. Now you have. This was Nikon's very first 'electronic' still camera announced in 1988. It's not only one of the first, it's also one of the rarest digital cameras ever made. 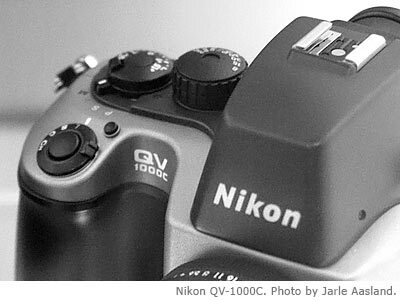 Update, May 2011: for more information about this camera, check out this comprehensive QV-1000C article, including information from key people with unique insight into the development, marketing and real world operation of Nikon's first electronic camera. 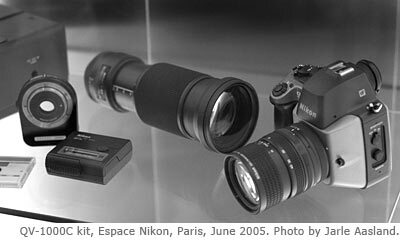 Two of these cameras are located in France: The first was given by Nikon to the Museum of photography in Bièvres, the other is located in the 'Espace Nikon' shop in Paris. Recently, my wife and I made a romantic weekend trip to Paris. Being a very understanding and supporting wife (as I've mentioned before), she agreed to let me go to 88 Boulevard de Beaumarchais and have a look. 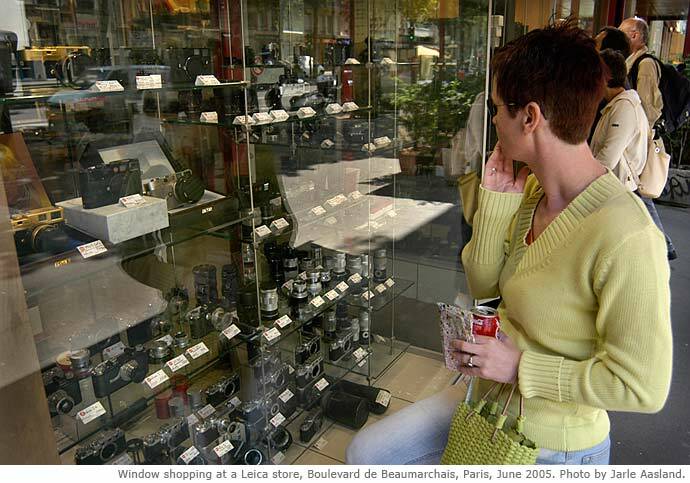 Apparently, this is 'the' photo street in Paris, with numerous tantalizing shops. Unfortunately (or fortunately, depending who you ask), we arrived in the area a few minutes before 1 p.m. on a Saturday, meaning the shops were about to close. Actually, they did open again about an hour later (closing at 6 p.m. in the evening), but I didn't want to push my luck. There were not too many other interesting shops or cafees in this particular area. Or maybe I just didn't notice - I really don't know. I only saw cameras. 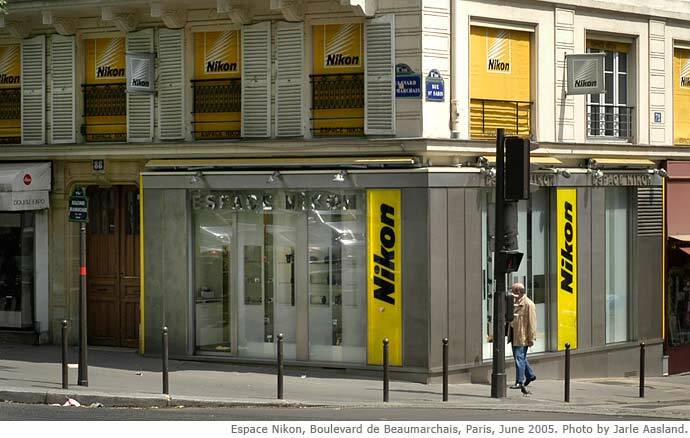 Entering 'Espace Nikon' five minutes to one, I was in Nikon heaven. It's not a big shop, but very, very impressive (again, it depends who you ask. My wife was not impressed). Behind glass is a very nice collection of old Nikon cameras and Nikkor lenses. Unfortunately, time was short so I couldn't afford to waste any. I quickly found what I came for: A complete QV-1000C kit, including both 'QV'-lenses (10-40mm f/1.4 and 11-120mm f/2! 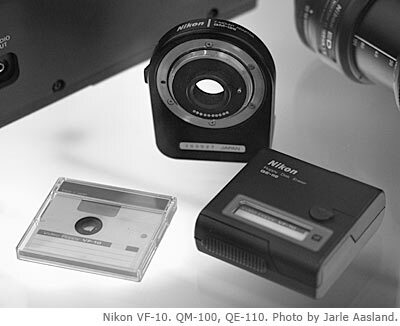 ), a VF-10 video floppy disk, QM-100 F mount adapter, QE-110 Floppy Disk Eraser, and QV-1010T transmitter (this B/W camera was only sold to news photographers). (For those familiar with Nikon's NT-1000A telephoto transmitter you'll see the family resemblance, even if the QV-1010T is considerably smaller. 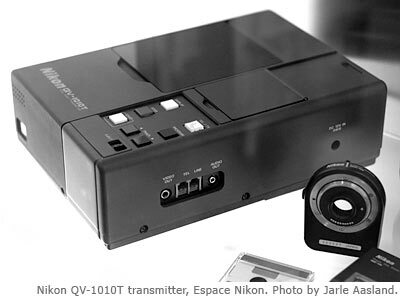 Unlike the older (1985) transmitter, there's no need for a built in film scanner in the QV-1010T). The camera body itself looks like a mix of a Nikon F4 and E-series body. Again, it's relatively easy to see the family resemblance. They probably thought I was crazy (or at least desperate, which I probably was), but the staff kindly allowed me to spend a few minutes photographing the equipment, while they were closing the shop. I suddenly noticed that the entire room was darker than when we first arrived, and realized that heavy-duty metalic shutters covered all the windows. Best security I've ever seen in a photo store! Shooting with my D100, I made about 30 shots before my wife pulled me back to reality. Again, the store manager probably thought I was crazy. I asked the manager (or whatever his title) a few questions while shooting. Unfortunately I don't speak any French, so the conversation was kind of slow. 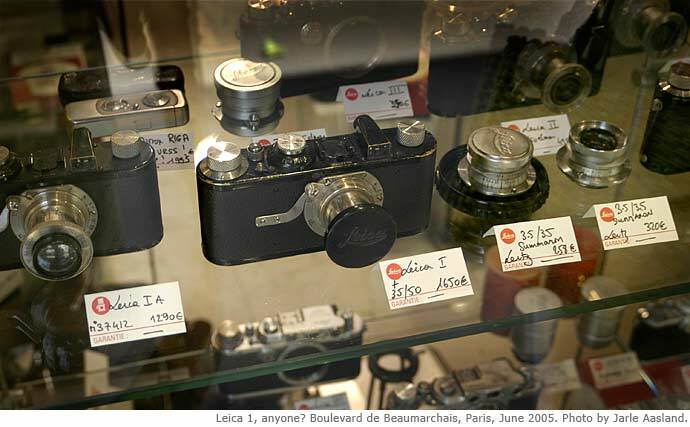 From what I understood (please correct me if I'm wrong), all the equipment on display at 'Espace Nikon' is owned by Nikon France, and placed in the shop for ordinary people to admire (or impress, to sell more stuff). I never figured out if the shop itself is owned by Nikon, but there's no doubt they have a very good relationship! I didn't notice too many of the other cameras on display, but at least I glimpsed a motorized Nikon F, an F2 (?) and a F3/MD-4 with the enormous and very rare 6mm fisheye mounted. Only thing in the store that impressed my wife. Apparently, size does matter after all. 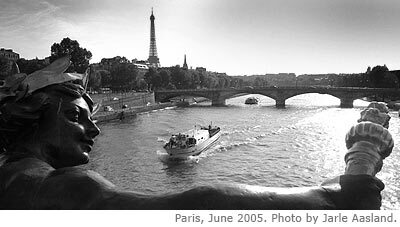 Needless to say, Paris is a wonderful city both to visit and photograph. This time, I decided to travel light, and left my D2X at home. Instead I only carried my old trusted D100 (without the MB-D100 battery pack), a few lenses, spare batteries and a 4 GB CF-card. 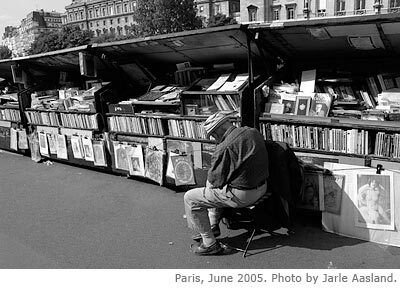 A book seller on the left bank of the Seine river, a late Saturday afternoon, June 2005. Shooting mostly JPEG Fine, I captured almost 1000 frames during the weekend. 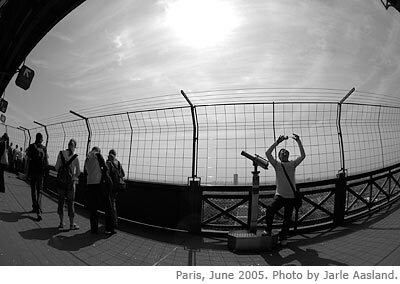 Here's one from the Eiffel tower, taken with a 10.5mm fisheye (a very fun lens to use in a crowded city). 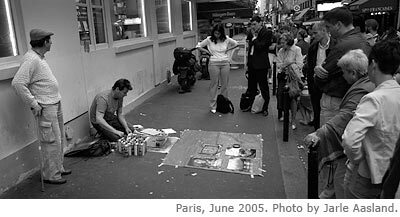 Local artist in the Latin quarter, near our hotel (which was very nice, by the way). A few weeks after my Paris trip I got my own QV-1000C, the only such camera sold in Norway. Complete kit including the two QV lenses, several disks, QE-110 Floppy Disk Eraser, QV-1010T transmitter, etc. More details in the discussion forum and future articles.